Los datos y el uso de la tecnología digital ahora son facilitadores clave, incluso para los agricultores, grandes y pequeños. El sector sanitario se está aprovechando de blockchain para mejorar la atención del paciente, la privacidad y la seguridad de los medicamentos. Para los laboratorios farmacéuticos, la transformación digital ahorra tiempo y dinero. It is no surprise: the healthcare industry is pressured to regulate costs and provide quality care, while under regulatory scrutiny. Blockchain has the potential to address the challenge of patient data security across geographies, while curbing costs. The healthcare industry is under extreme pressure to both regulate costs and to provide high quality to patients. As the industry evolves alongside emergent market- disruptive technologies, it becomes increasingly difficult for businesses to keep costs down while remaining competitive. Blockchain has the potential to alleviate one of the major challenges of the industry: the transmission of patient data across geographies without compromising its privacy and security. This application of blockchain can have a major, positive impact on member health management and also provide a critical link in the support of medical tourism. This paper discusses the evolution of blockchain technology and how its application can produce a breakthrough in the healthcare industry; more specifically, the benefits it can bring to case management and member health management. Next Ciberseguridad en el sector agroalimentario. Asegurar los datos como un activo crucial para la agricultura. The challenges in agriculture are enormous; imagine feeding 10 billion people in 2050. Going digital in agriculture and food science means new services, better access to real-time data, and coordination between farmers and food companies. In 30 years the world will need 70% more food, of better quality, and produced in a sustainable way. Agriculture must take advantage of the new and effective data-enabled products and services to feed the 9.7 billion people of 2050. But, as a matter of fact, those involved in this industry, farmers or multinationals, have little or no history of convergence. Open innovation and other drivers that have been fueling the digital transformation in other sectors, are still missing in agriculture. As a result of the current scenario in agribusiness, a variety of food companies requested for our insights regarding the ongoing digital revolution in agriculture. Thanks to our strong end-to-end experience from the field to the fork value chain: we as Capgemini are helping players of all sizes, identifying where technology can give them an edge in this dynamically changing and competitive market. Ciberseguridad en el sector agroalimentario. Asegurar los datos como un activo crucial para la agricultura. Next Información sobre Blockchain. Oportunidades y desafíos en múltiples industrias. The agrifood sector has transformed itself into a more data-driven and complex ecosystem. Companies have become increasingly dependent on IT in their primary processes and almost 100% availability is required these days. Growing digital requirements and trends (for example mobility, cloud computing, IoT, big data) continue to pose new challenges when it comes to cybersecurity. Technology like data platforms, wireless sensor networks, RFID, GPS, business management systems can be vulnerable to breakdown, abuse and misuse. What are the actual threats to agrifood businesses? Software is a crucial part of the digital infrastructure in the agrifood sector. Vulnerabilities in software and systems remain relentlessly high. Software suppliers in 2014 released thousands of updates in order to repair vulnerabilities in their software. This is the main problem when it comes to cybersecurity. The lack of IT sustainability becomes more and more a problem because a lot of software cannot easily be updated, especially in process control systems. Información sobre Blockchain. Oportunidades y desafíos en múltiples industrias. Previous Ciberseguridad en el sector agroalimentario. Asegurar los datos como un activo crucial para la agricultura. Industries like financial services, cybersecurity, education, healthcare, auto leasing, IoT, supply chain management, government, and human resources have begun to explore the application of Blockchain for a variety of uses; however, most uses remain experimental. Healthcare firms are drawn to Blockchain as they work to meet new requirements around the security and privacy of sensitive patient data. Healthcare organizations have outpaced a lot of other industries when it comes to Blockchain adoption: they are even ahead of the financial industry. Previous Información sobre Blockchain. Oportunidades y desafíos en múltiples industrias. “Beyond the pill” describes the trend to provide sophisticated augmentation of the pharmaceutical value chain on the patient side. Driven by digitalization, the underlying product is increasingly embedded into a digital ecosystem. This digital enrichment provides a variety of options, particularly toward improving patient relations management. So far—unlike for consumer goods—there has been a gap between pharmaceutical manufacturers and consumers (i.e., patients) that could only be partially overcome through market research data. Thus, it has been relatively difficult to directly connect and engage with patients to, first of all, increase brand awareness and, secondly, enhance brand loyalty. Consequently “Beyond the pill” has significant win-win potential. Patients are moving even further into focus with regard to tailored medicine, seamless access to treatment-related information, and continuously improving support of their therapy. At the same time, manufacturers are positioning themselves to design a digital ecosystem within which they can reduce transaction costs, improve patient data availability and transparency, and get direct access to patients. A key challenge, however, is to set the focus correctly. The current state only seems to be the starting point of a digital journey. Maturity models are mostly comparably low and require a well-targeted approach. Not all of the above-mentioned areas can be addressed at the same time. 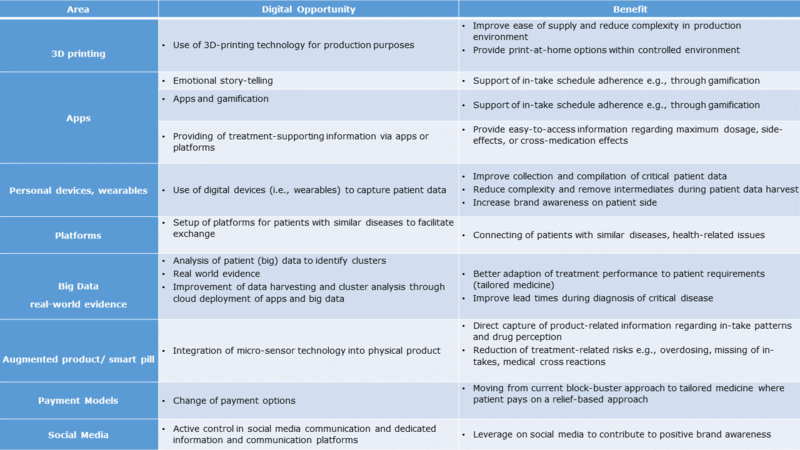 Moving the pharmaceutical value chain into the digital realm merely because it is trendy or “expected” will certainly fall short of its potential. A clear and consistent alignment of a (digital) strategy and patient value proposal are key to making “beyond the pill” a successful game changer.